Must be using Stripe payment gateway. Trials are only applicable on recurring levels. 1. 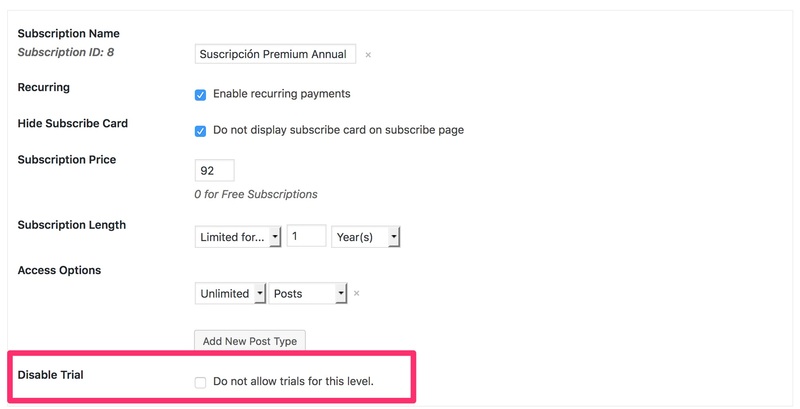 Go to Leaky Paywall > Settings > Subscriptions > Trials in the WordPress admin. 2. Check the “Enable Trials” setting. 3. Set the Trial Period Length to a number greater than zero. 4. Set the message to display above the subscribe cards. 5. If you are using the registration form, you can set the message to display above your registration form as well. 6. Click the blue “Save Settings” button. At this point, trials are enabled for all recurring levels. If you would like to disable trials on a certain level, go that level’s settings and check the “Disable Trial” box.